Notice: Fishing vessels accidents are not included in the statistics, though may be recorded. 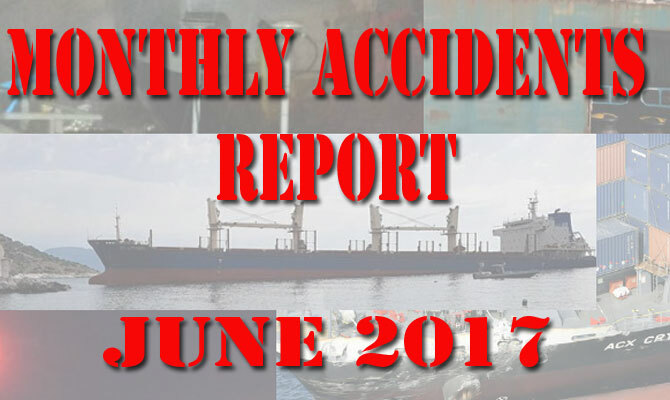 June 2017: 110 accidents recorded, at least 5 vessels lost, at least 31 casualties. May 2017: 124 accidents recorded, at least 10 vessels lost, at least 17 casualties, at least 7 crew kidnapped. April 2017: 114 accidents recorded, at least 7 vessels sank, at least 32 casualties, at least 14 crew kidnapped. March 2017: 122 accidents recorded, at least 10 vessels lost, at least 52 sailors died and went missing, 2 sailors kidnapped. February 2017: 120 accidents recorded, at least 4 vessels lost, at least 8 sailors died, 1 crew killed and 14 kidnapped.